Fun stuff on the design wall today! 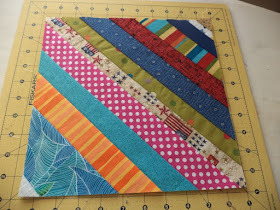 The patchwork mosaic blocks from September's block challenge are still coming in, but I have enough already to put the first top together. With September wrapping up it's time to think about next month's block drive. 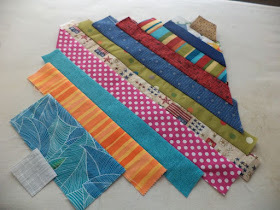 Rhonda from the Tyler Modern Quilt Group gave me a bunch of foundation pieced string blocks which got me thinking, scrappy strings would be a great block drive for October! 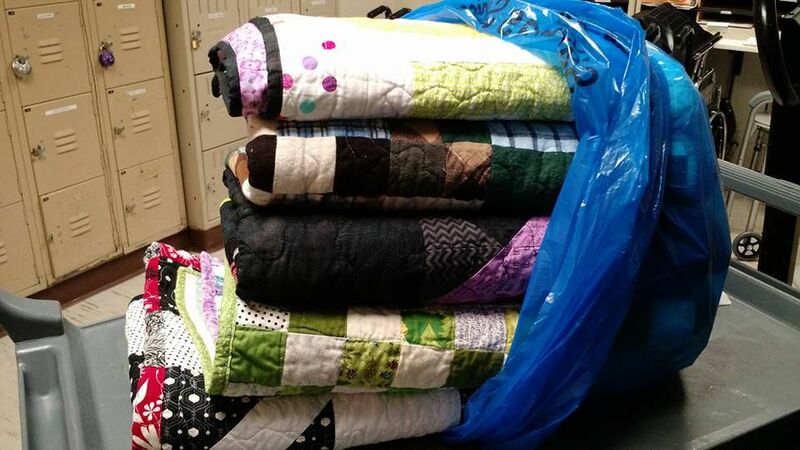 Remember, these blocks go toward Covered in Love giving quilts to people who lose loved ones in the hospital. Foundation pieced string blocks are super easy to make. First cut 11" squares from some scrap fabric. I used an old sheet, you could also use muslin. It won't be seen, so it doesn't matter what's on this fabric. Then grab your string scraps. For this quilt let's go crazy, no color scheme, everything goes! Start by putting a string across the foundation diagonally face up. Then grab another string and lay it on top face down. 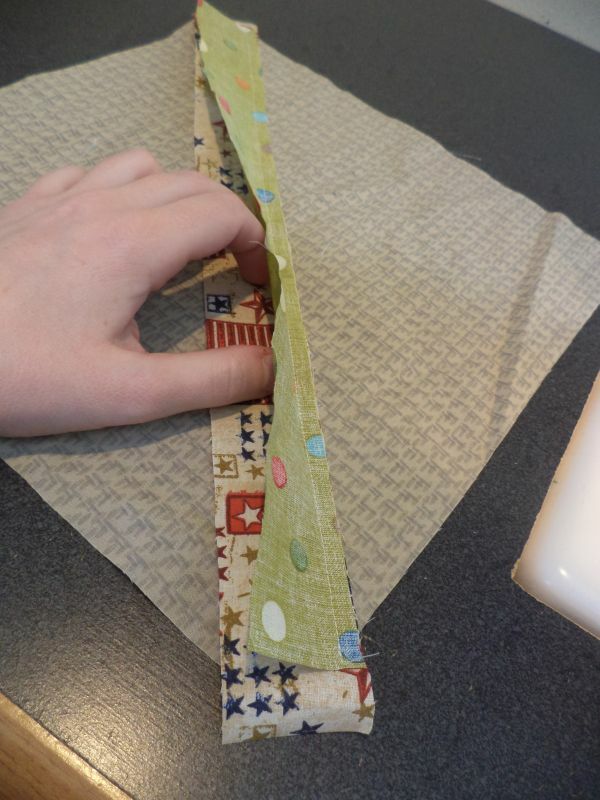 Sew a quarter inch seam along the side and press open. Continue adding strings and pressing them out, make sure each one is long enough to cover the foundation square. When you get to the corner, flip the block around and continue adding strings to the other side until you cover the entire foundation. Once you have covered the entire foundation in strings you'll need to trim the block. This is easiest to do from the back so you can see the foundation. Trim to 10.5" square. 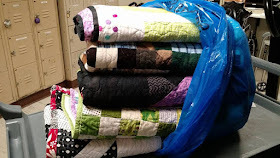 If you want to send in a block or twelve please leave a comment or send me an for the address. 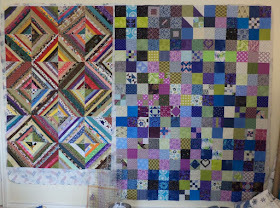 With the blocks Rhonda gave me we are already most of the way toward one top, I'd love to make three tops this month! 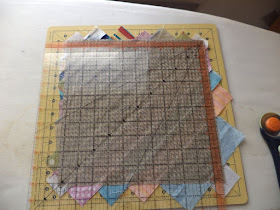 I will be happy to make and send you some blocks.....I have always used muslin - never thought about using sheets as foundation pieces.. How many blocks does it take to make a quilt? Love the string blocks! 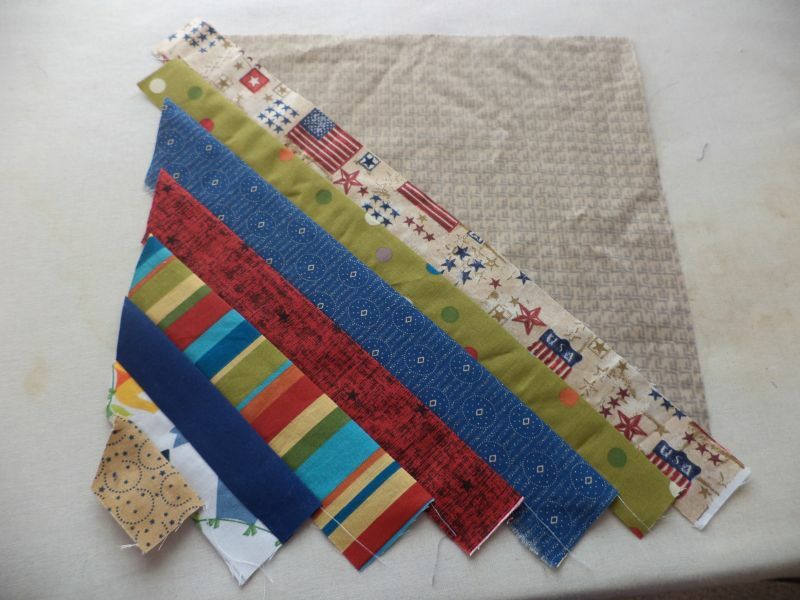 Always a great way to use up those scraps! String blocks? I'm in for at least a few. Probably toward the end of the month as October is shaping up to be pretty busy here. Love how September quilt is turning out! I love making string blocks, so will try to send a few of those, too! patchwork mosaic will turn a beautiful quilt, as the string blocks. Love them both. String blocks are great fun! 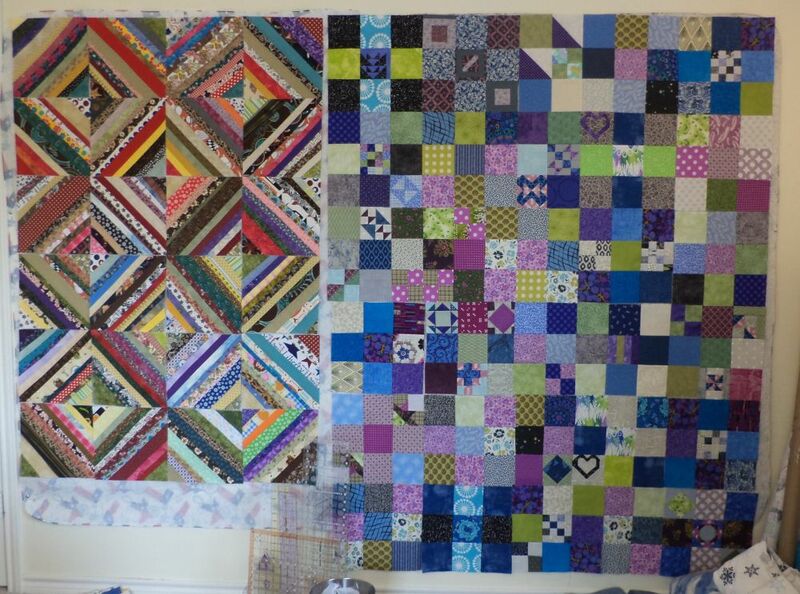 I really like how your purple and blue patchwork quilt looks. Thanks for sharing all your scrappy goodness with Oh Scrap! I've gotta try that string thing one of these days! I like this string block - looks like fun. I'm pretty pressed for time - but I'm thinking this would be nice to make. I am asking ladies from my local bees to pitch in and make a block or two. Hopefully, you'll be getting a bunch from Houston in October! Hi Kat, I would like to contribute a block or two. Could you send me the address at jmshelley1@yahoo.com? Hi Kat, I'd love to participate! I can contribute also. Trying to get my scrap bags whittled down. Need your address! I have 11 blocks ready to send, if you'll send me your address. I am ready to send some blocks. Please send me the mailing address. This is the very first charity project I have ever participated in and the first string blocks I have made. Very enjoyable process.